Here at St Helens Law we provide a wide range of legal services and have become renowned for providing a quality professional service, with dedicated staff offering a client focused approach. Our Residential Property department provides a full range of conveyancing services, including sales, purchases, remortgage and equity release. Equity release is becoming increasingly popular as a way of raising funds for people. Most providers and advisors are reputable and the product is sold in the best interests of the client. Unfortunately there are always some who want to make more from a transaction than is morally justifiable and sometimes legally allowable. There are certain safeguards that can be used. One is to look for an accreditation such as ‘’SHIPS’’ but a safer way is to seek out advice from an independent solicitor before signing agreements or paying any fees at all. St Helens Law are well placed to provide such advice on a FREE of charge basis. Equity release can work. It is usually where part of the value of the property is released to the owner in the form of a lump sum or an income. You need to be over 55 and if the transaction is from a bone fide provider then you can guarantee that there will be at least part of the value of your home left to give to your family. The monies that you borrow accrues interest. You can either pay some or all of the interest or simply let it roll up and be paid off on death or when you sell the property. Advice before and during the transaction is vital and this is where St Helens Law can help. 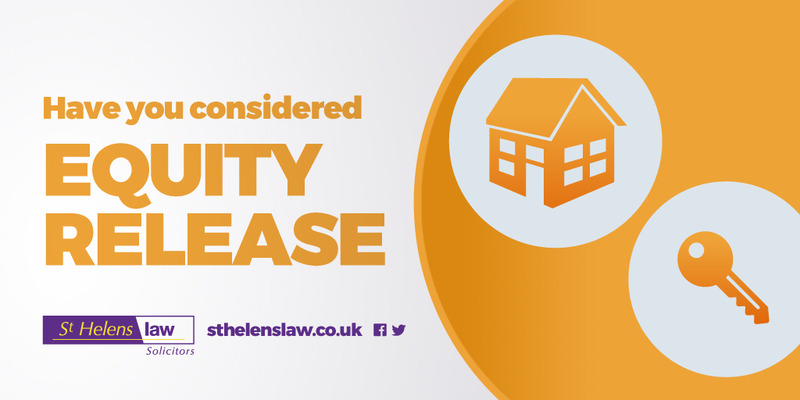 If you would like to discuss Equity Release with one of our solicitors or any other legal matter, then please email info@sthelenslaw.co.uk or call 01744 454433 to arrange an appointment.